Moynihan was concerned for the individual pressed into unfamiliar service during the war. The juxtaposition of the bland colours of uniform, camouflage and machinery contrast with the volunteer's own innocent features. 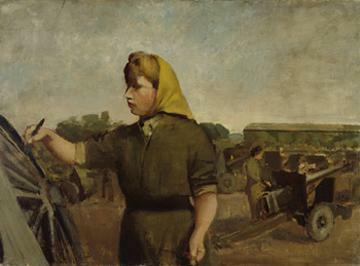 Moynihan's careful attention to the figure, and in particular to her painting arm, emphasises the care she is making in her own work; an approach that seems at odds with the military exercises in the background.